Smoothies can sometimes get a bit repetitive for breakfast, and take some effort. Granola and yogurt on the other hand require none. A weekend morning of baking rewards you with a crispy, flavorful treat for weeks to come. A generous scoop of yogurt and a sprinkling of granola in the morning leaves you with a filling meal and energy to start your day. Coconut oil helps form the base of the granola mixture, leaving a rich creamy taste beyond what common canola oil can give. Coconut flakes add texture and the addition of chai spices is alluring. 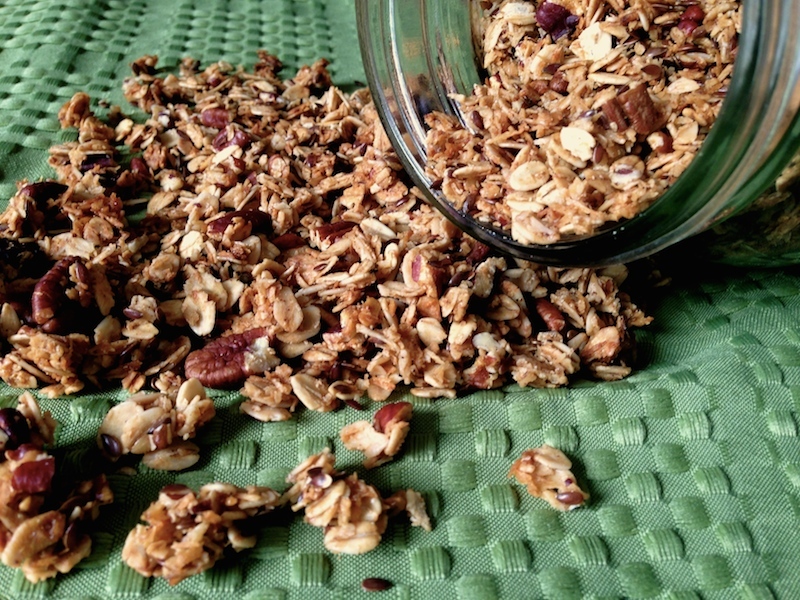 If for no other reason, make this granola for the sake of your nose. I promise your kitchen will never smell better than with this granola baking in your oven. Preheat Oven to 300°F. In a large bowl mix together oats, pecans, shredded coconut, flaxseed and salt. In a small bowl, mix together coconut oil, honey and spices until emulsified. Pour wet ingredients over oat mixture and mix well with a spatula until granola is evenly coated. Spread granola onto a parchment-lined rimmed baking sheet. Bake for 45 minutes, stirring every 15 minutes. Remove from oven and cool completely before transferring to an airtight container. I add a ton of coconut to my granola too, I love it, something about the oats and coconut flakes together is heavenly. Love your chai spice addition.